The blueprint you see here was part of an incredible find of pre-production material relating to the design of the first Kenner Star Wars figures. The were made by one of the original designers of the line, a man who had a hand in the creation of every Star Wars action figure made prior to the debut of Boba Fett in 1979. 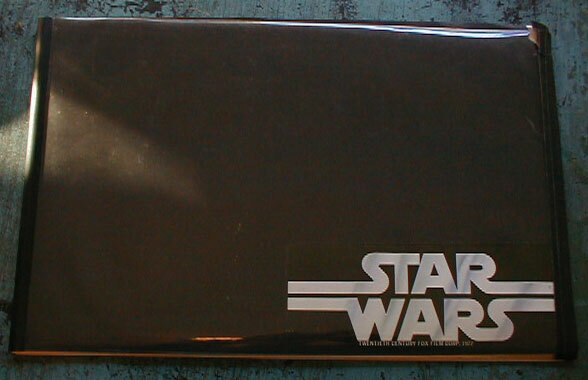 Following his departure from Kenner, this designer took all the bluprints he saved--16 in all--and bound them in a portfolio with an attractive Star Wars cover. I don't think I have to resort to a lot of fancy adjectives to drive home how significant this stuff is-- it's representative of the design process behind one of the most popular toy lines in history. 'Nuf said. 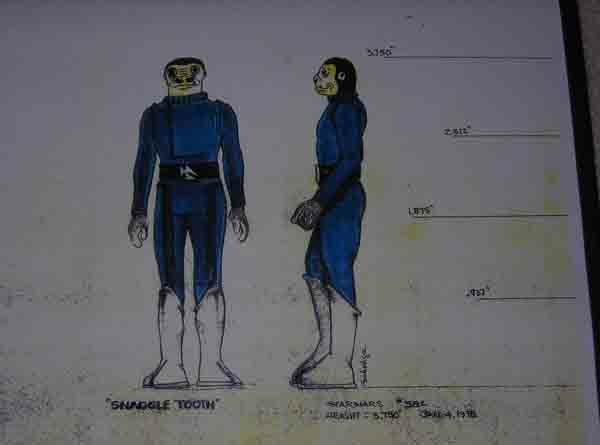 Here you see the blueprint for the infamous Blue Snaggletooth figure, distributed solely by Sears during the 1978 holiday season. 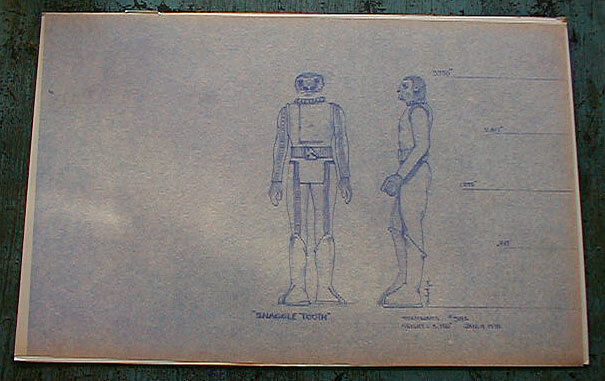 That's right, the designer who created these blueprints was the same one who erred by making the Snaggletooth figure taller than Lucasfilm intended the character to be. 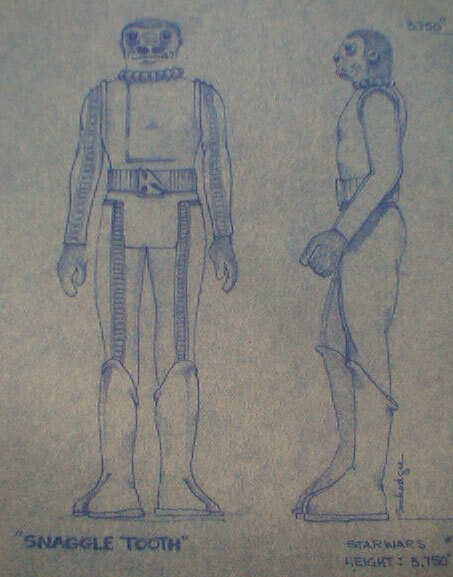 As the story goes, the only reference materials Kenner was provided with for the design of their four Cantina characters were in the form of head shots, which failed to show the characters' bodies. Thus Snaggletooth was made as tall as most of the other figures-- 3.75". In fact, here's a shot of the height specification noted on the blueprint, along with the date on which the blueprint was made. Here's a general closeup of the character image. My favorite portion of the Blue Snaggletooth story is that which explains the creation of the figure's distinctive belt buckle. 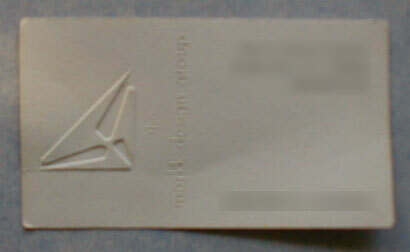 Apparently, the designer, when trying to come up with a suitable buckle design, turned to a logo used on his old business card. Here you see that business card, which, as you can see, bears the logo. Not only is it a great story, to have this kind of physical evidence of it is just terrific. This is the cover of the porfolio in which all of these blueprints are stored. Here we have the colored photocopy referred to above. Once colored, the figure representations would be better able to approximate the final look of the toys at in house design meetings and the like. This rendering done in magic marker seems to be where the infamous blue color of Snaggletooth originated. Make no mistake, this is neat stuff. The fact that it comes from so early in the history of the Star Wars toy line only makes it sweeter.